Of the organic cereals grown in Finland oats are by far the most important. 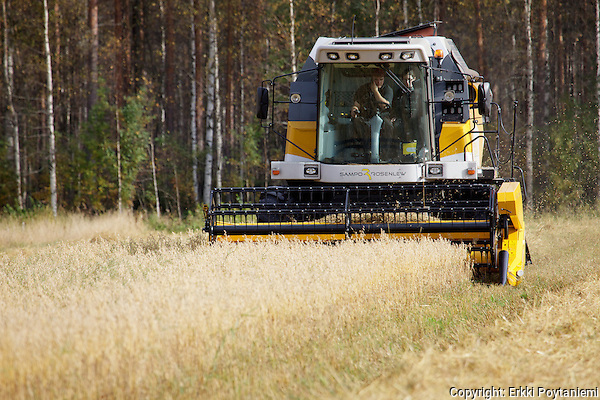 According to Evira statistics organic oats was grown on 19.583 ha in Finland which is only 300 ha more than in 2006. However the total yield might be double 2006 due to the record low harvest that year. But is this enough? I am afraid not. The dynamism of the market is difficult to grasp and therefore nobody seems to know how much will enter the market. Part of the harvest is fed to animals on-farm or sold to neighbors for that purpose. Part of the crop is harvested on small farms and there is no point in transporting it over any distance. For the organic oats that does enter the market there are several buyers, some trading it to the domestic industry but most looking at the export market. Helsinki Mills is buying directly from farmers trying to capture as much of the oats as possible for processing in Finland. So the farmers situation should be quite good. The prices have increased to levels that have not been experienced before during Finland’s EU membership. Prices are up to 2,5 times higher than in 2005. So there should be an incentive for more farmers to go organic. Also conventional oats (as all cereals) price is increasing but nevertheless the price difference is a healthy 100+ €/t. Sweden, Germany and Canada seem to have experienced average oat harvests on similar acreage as 2006. The main problem would seem to be that the market is growing strongly but production is not. We need more organic farmers. The interesting question which remains to be seen is how farmers react to this clear market signal. If farmers consider converting to organics they will naturally be wondering what the organic oats price will be in 2010. Who can tell? In the meantime we are unfortunately not able to meet the demand. TIKE, the Information Centre of the Ministry of Agriculture and Forestry in Finland, has for the first time collected data on the use of organic crops in Finland. The data for the 2006 crop of organic cereals (wheat, rye, oats and barley) has now been released. It shows that the production of organic cereals was 47 million kg or 1,2 % of total cereal production in Finland. By far the biggest crop (51 % of organic total) was oats. What is stricking about the statistics is that the average crop was only c 50 % of normal and also that only 51 % of that entered the market as organic. So only 12 million kg of organic oats entered the market which is far less than is normally exported from Finland as bulk – not to speak about domestic consumption and Helsinki Mills’ export of oat flakes. The numbers fully explain the crises we have been in regarding organic oats in Finland. Where are the organic oats? Oats seems to be a prime example of the organic commodity market with its ups and downs. Finland is the biggest organic oats producer in Europe and also the country with the biggest oversupply. This year however the product just isn’t there. Why? The strong growth of the organic acreage in the 90’s in Finland was largely driven by subsidies. 40% of that acreage is cereals and the most imortant cereal is oats, which is very well adapted to Finnish soil types and the Finnish climate. So Finland had a big surplus of organic oats and became a big exporter. As a consequence farm gate prices were very low until 2005/06. Those prices were not profitable for the farmers so many pulled out: the acreage of organic oats in Finland decreased by 3000 ha. Partly permanently with farmers going back to conventional – partly as a shift within organics. On top of the decreased acreage came last summers extremily warm and dry weather. Yields were 15-20% less than normal, but even more importantly some farms harvested almost no milling quality oats and the proportion of shrinked grain is very high. Flake yield in milling is very low. These factors together result in only c 50% yield of milling quality organic oats compared to normal situation. The situation is of course catastrphic to those companies who are committed to exporting organic oat products. Every stone is turned to find the remaining oats. F.ex. Helsinki Mills has offered animal-farms to change their organic oats into conventional fodder (many organic farms do not market their animal products as organic). What will happen next? Prices are increasing to extremily high levels and contract prices for the 2007 crop in Finland will be at a substantially higher level than 2006. This should bring some of the lost acreage back but those farmers who have gone back to conventional are probably lost permanently. Certainly their will be an increase in organic oats acreage in Finland, Sweden, Germany and other countries. But also other organic grain prices – even conventional due to biofuel – are increasing so it is not so clear what will happen. In any case the market demand is strong and I believe the farm-gate prices will be ‘permanently’ (what ever that means) higher and farmers are safe to increase their acreages even if it means they need to convert from conventional. But when the prices start to decrease eventually we should be careful to avoid this happening again. Farm-gate prices must be kept at a sustainable level – otherwise the same cycle will follow again.